You have probably been looking around and seen a lot of different types of varsity jackets out there but wondering which is the right one for you. 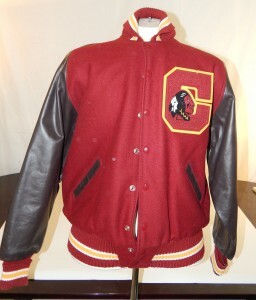 The nice thing about getting a letterman jacket is that you can make it your own. You get custom patches which usually include your sport or academic accreditation such as a football or a chess piece logo , the year, your school logo, and other patches and pins of sorts. 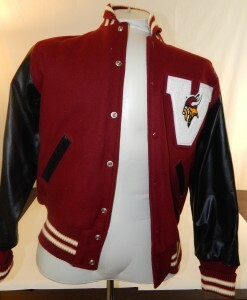 Your jacket should be the colors of your school in some combination. For instance if your school's colors are orange and white then you would want an orange body and white stripes or vice versa. If you are going to be getting a leather sleeve jacket, you can usually just choose the color of leather you want. The color of the leather doesn't usually reflect the school colors but rather compliment them. The most popular colors of leather are black, white, off-white (cream) and brown. However, I have seen all colors of leather sleeves including red. Its really up to the guy or girl who gets the jacket. Often, someone on the team will get a color they like which is not the standard, say white sleeves instead of black and the rest of team will follow suit. 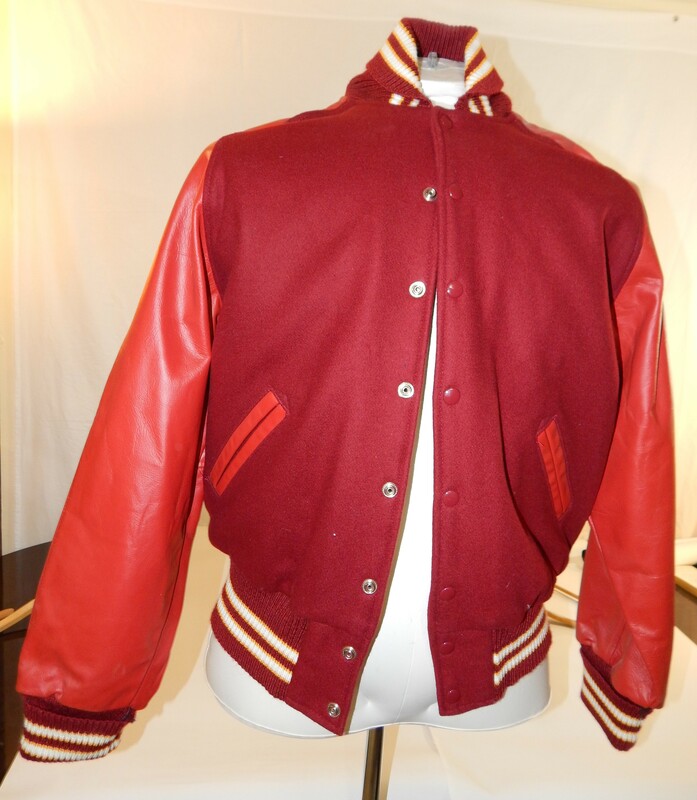 Here is an example of a jacket we sold with 3 different leather arm color combinations - red, brown, & black. As far as collar style types, there are quite a few including: Knit Stand Up, Whiting, Wool or Leather Byron, Sailor, and Hooded. For guys, by far the most popular that we have worked with are Whiting and Knit Stand Up. The photos above are Whiting style collars where the wool is folded over. Usually there is a stripe or two but sometimes it is the solid color the same as the jacket as well. For girls it seems to vary more, Sailor style used to be more popular but most are either Hooded or Knit Stand Up. 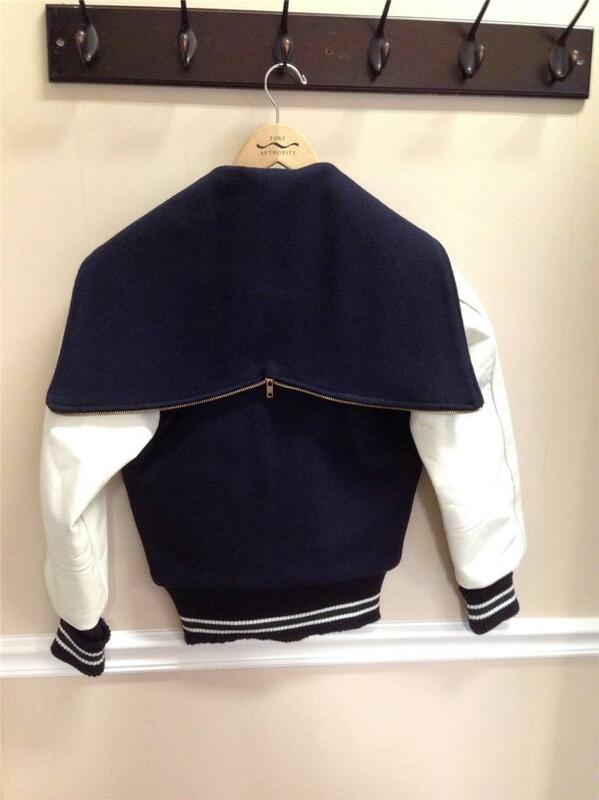 Here is a photo of a hooded girls jacket that zips in the back that we recently sold. 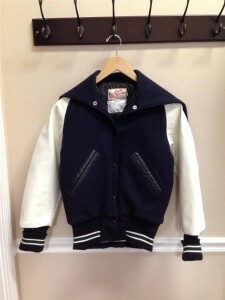 See the next post for more on different letterman jacket popular styles.